The airboat stage in HL2 is, as Jeremy Parish of GameSpite noted, “distilled anti-fun.” And it seemed to go on for eleventy-billion hours, too. Gawd. And while I’m at it, the dune buggy driving stage (“Highway 17”) was a bit of a snoozer for me, too. 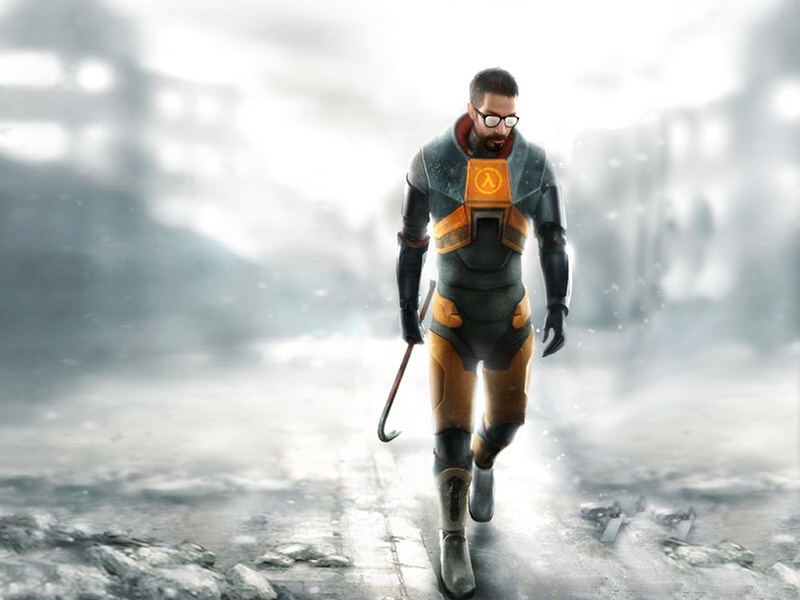 I was honestly wondering at one point why they didn’t merely call the game “Gordon Freeman’s Road Trip.” Because up until you get to Nova Prospekt, you pretty much spent most of the game traveling in a vehicle of some sort. On the other hand, I loved driving the beat-up Charger in HL: Episode 2. Probably because it was a Charger. I never could get Half-Life: Blue Shift to work on my PC, so I was wondering who the hell Barney was when he first introduced himself. Now that I know who he is, I still don’t care. I was hoping I’d be able to play as “the Alyx Vance” at some point. Alas. I kept wanting to call Gordon Freeman “Morgan Freeman.” Just think: if Andy and Red had the HEV suit with them at Shawshank, they wouldn’t have needed to wait three decades to get out. It’s been a great time for games, definitely. Mass Effect was one of the best I’ve played in a long time. I’ve barely started Assassin’s Creed, and am about halfway through Orange Box, plus there’s Call of Duty 4 (borrowed from a friend) and a host of additional PS3 and Wii games. Bwah! “Gordon Freeman’s Road Trip!” That’s hilarity. While the airboat and dune buggy chapters were a little dry, neither of them irritated me as much as “Anticitizen One,” the chapter where you’re leading the slightly brain-dead friendly AI around City 17. Talk about an annoying group of fools. I actually never finished the original HL2, nor have I played Episodes 1 or 2 yet, so I have a ways to go. But I did see screenshots of that Charger-looking vehicle prior to release. Looking forward to it. Oh! And of course, your shouts of “Benson!” in turn remind me of Millington. Yeah, lots and lots of games are out that I want to play. And that’s not even getting into the stuff I’ve been reading about that hasn’t dropped yet. Assassin’s Creed was fun, but it definitely gets very repetitive. And the “ending” SCREAMS “Sequel!! !” It annoys me when games do that. I actually got Mass Effect on Christmas Day, and beat it six days later — logging over 40 hours on it. I couldn’t put it down. Of course, that one pretty much says “Sequel!” at the end too, but at least there was some closure, which I didn’t really feel with Assassin’s Creed. Reaper showed me CoD4 when I was over at his place last week. Looks decent, but war games have never really piqued my interest (for whatever reason). Oh God, I must have completely shoved “Anticitizen One” out of my mind…because yes, those AI comrades were dumber than a box of hair. And those jerkoffs kept GETTING. IN. MY. WAY. So I’d have to keep reloading save games because I’d walk somewhere, get shot at, and not be able to retreat because four AI bozos were blocking my path. God I hated that level. I must say, though, that I like having Alyx as a companion in Eps. 1 and 2 — she’s pretty much a walking tank. She’s especially helpful when you’re limited to the gravity gun (or low on ammo) at some points — speaking of which, I thought the gravity gun was fun, but overrated. I much prefer the powered-up version you get at the end of HL2 that shoots lightning and can pick up bodies like ragdolls. They should have made the normal grav gun do that. I finished HL2, HL: Ep 1, Portal, and am somewhere near the end of Episode 2. I can’t believe I’ve actually began and completed nearly six games in the past couple of months. Surreal. That sounds like about how long I spent on Mass Effect, too. After I finished, I immediately went back and started a second play-through, since you can start with your leveled-up character. I’m rarely enthused enough with a game to start a second run immediately after finishing. It occurred to me that Mass Effect is the calibur of game we should be getting from the Star Trek license. It reminded me very much of the old Interplay Trek adventure games (20th Anniversary, Judgment Rites) that were so good. Why the hell does every Trek game today have have to be a generic space combat shooter? We’ve had nearly 10 years of that and it’s time to stop. It’s like the round-robin of companies who keep getting the Trek IP license are as low on ideas as Bermaga had become. As for “Anticitizen One,” for me, likewise, it was how you kept bumping into those doofs that pissed me off. “Excuse me, Doctor.” “Sorry.” UGH! Just STAY BACK, fools! Quit crowding me! And then those stupid mines would take them out. I forget what they’re called…bah. Everyone I’ve talked to says the same thing about the “zero-point energy field manipulator,” AKA the gravity gun — that the “powered up” version was way better and should have been how the gun behaved all along. I’ve still never made it far enough to get the “powered up” version, but it certainly sounds enticing. Sounds like Orange Box is what I should put back into my 360 next.